Clarke Energy have recently donated a large collection of food, toiletries and gifts to the The Big Help Project & Knowsley Foodbank’s Christmas appeal, in preparation for what promises to be a difficult festive season for many people across the borough. The Knowsley Foodbank regularly provides emergency parcels to up to 8,000 people, including 4,000 children, with essential supplies to help combat hunger and poverty. 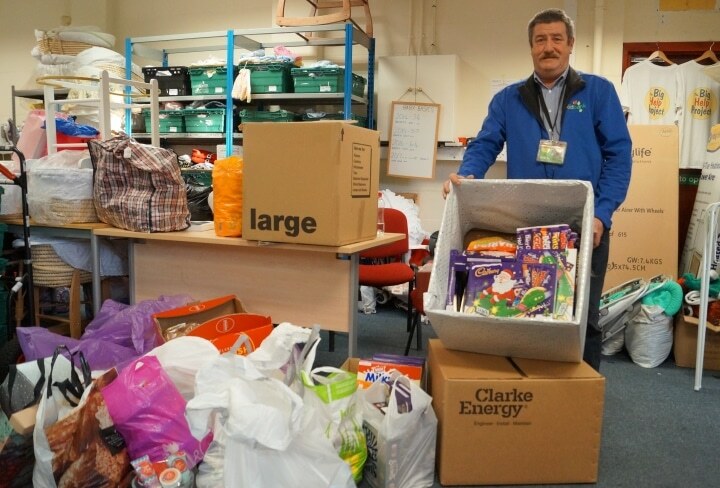 In the lead up to Christmas, Clarke Energy staff have generously been donating items for these parcels in order to ensure people in the local community, who are unfortunately dependent on food banks, have enough food for themselves and their families over the Christmas holidays. To try and make Christmas special to as many local people as possible, luxury items such as biscuits, chocolates, sweets, mince pies and stocking fillers like male and female gift sets have also been donated. However basics such as toiletries, long lasting food items like UHT milk, dried pasta and tinned foods are also required as some people are often left with the difficult decision of “heating or eating” at this time of year. The food bank is situated on Admin Road, Kirkby, a short distance from Clarke Energy’s Knowsley Headquarters and earlier this year they supported the Big Help Project by donating Easter eggs and advent calendars from staff to local children. Jimmy Swift of The Knowsley Foodbank explained that although Christmas donations are greatly received the food bank are reliant on local businesses and people to donate as much as they can all year round.